On the long drive from Seattle to South Carolina, the Addison family – Tonio and Julia, their son Dewey and Tonio’s brother, Robbie – are forced off the highway by a massive snowstorm and find themselves in the small town of Good Night, Idaho. Taking a room in the town’s only hotel, the Travelers Rest, they settle down to wait. One by one, they separate from the group and find themselves reliving the same nightmare day after day, catching glimpses of each other but never quite able to regroup. As past and present merge, the family learns of Good Night’s mining-town origins, and discovers that they’re not the first people to fall foul of the Travelers Rest’s questionable hospitality. With time running out, it is up to the individual family members to break the cycle and make a bid for freedom. As the novel opens, Morris alternates the narrative – a trick that continues throughout the novel – to show us the dynamics of this family: Tonio is taking younger brother Robbie back to South Carolina as part of a court-ordered rehabilitation program, so there is already tension between the brothers; Julia and Robbie’s relationship, although not necessarily sexual in nature, is much stronger than that between the brothers, or even that between husband and wife; and ten-year-old Dewey, who seems much wiser than his years, can feel – if not understand – all of the tension around him. Things begin to fall apart almost immediately upon their arrival in Good Night, as Robbie disappears in the middle of the night, heading for the town’s watering hole, across the quiet main street. From there, each family member becomes separated from the others, and each finds themselves in a different version of reality, reliving the same day over and over as the snow continues to fall. 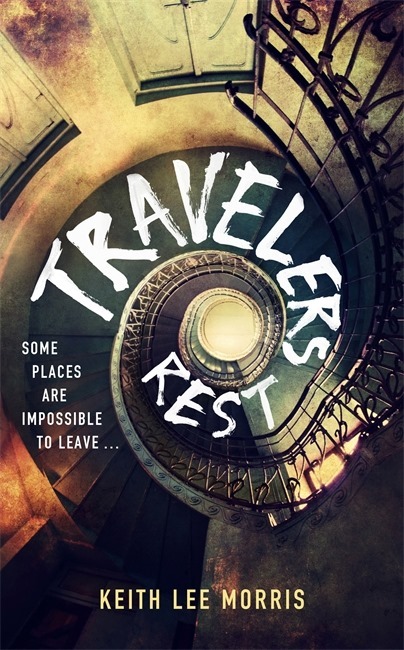 Essentially a haunted house tale, Travelers Rest follows in the footsteps of The Haunting of Hill House, Morris opting for a quiet, unsettling sense of horror that grows on the reader as the story progresses, rather than an all-out attack on the senses. The strength of Morris’ story-telling lies in his characterisations – this is very much a character-driven piece – not only of the Addison family, but of the denizens of Good Night whose paths they cross: Hugh and Lorraine, who own the town’s diner, and from whom we get much of the backstory, as they explain to Dewey the town’s “hunger”, and the souvenirs that it likes to keep; Stephanie, Hugh’s sister, who guides Robbie through these extraordinary events; and the smarmy and officious Mr A. Tiffany, proprietor of the Travelers Rest. The tension is palpable throughout the story: without introducing a ticking clock, Morris still manages to impose a sense of deadline on the reader, a feeling that time is running out. The seemingly endless snow gives the book a claustrophobic feel, yet we understand from early on that it’s not the reason the Addisons are here, or that they have stayed so long. Morris’ writing brings with it a certain immediacy, an intensity that draws the reader in and forces them to be part of the world he has created. The hotel affects different people in different ways; we see each of these different worlds through the eyes of the sufferers, and it’s clear that for many, escape is not something for which they strive. Thanks for the review. Sounds right up my alley. I’ll add it to my TBR!